Series Name: They Can't Stop Bullet! Nick 'Bullet' Carter is a soldier in the British Army. During all the time we follow Carter in the many adventures the man has during World War II, we learn one important fact - the man loves to ride motorcycles! He steals one in the first recorded tale and becomes semi-attached to it, loathing to give it up and using it to accomplish his many varied missions. When we first are introduced to him, he is in a German P.O.W. camp and from the sound of things, he has been there for a while but not content. In fact, he has just been recaptured. According to the dialogue between Carter and the Kommandant, this is not even close to the first time he had escaped. He has been dragged back to the Stalag and has just finished getting his "you can never escape" spiel from the irate warden when he espies a German cycle left unattended. He breaks free and manages to find a soft spot in the barricades in which to make his brazen jailbreak. Getting out of camp was tough but getting away from the many guards sent after him would be even harder but the key thing we learn from this event and the thing that will pay a recurring role in all the adventures he will have subsequently is that Carter can ride a motorcycle like it is an extension of him. Whether it is turning on a dime, leaping over walls and people, or plowing into a cache of armed men, he wields the bike like the professional he is. One of the obstacles he meets while making his getaway turns out to be a fellow soldier trying to get back to his side of the war having done a job for British Intelligence and needing to get his vital intel back to base. Carter has him hop onboard and together they get free and it is then that the spymaster at HQ offers Carter the job of going back into the fray using his riding skills to get places fairly quickly and often unobserved. Carter, loving excitement and riding, jumps at the offer. The "name" of this series is 'They Can't Stop Bullet'. The bullet they refer to is Carter, having gotten that nickname when he won the Isle of Man motorcycle race before the war started. He would prove the fact that he was virtually unstoppable many times thereafter. The exact creator(s) of the They Can't Stop Bullet! series has not come to light yet. 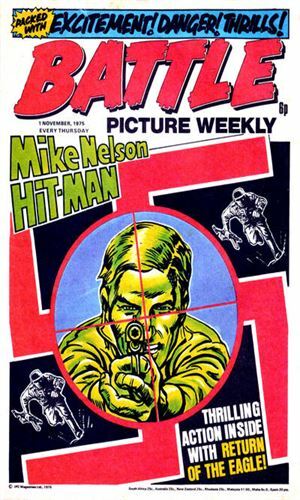 The industrious fellow spy-fan who has been providing all the information on this series for me has learned that the magazine was the creation of five people: Pat Mills, John Wagner, Gerry Finley-Day, Dave Hunt, Doug Church. It is probably that one or more of these creative souls came up with the idea of Nick 'Bullet' Carter. 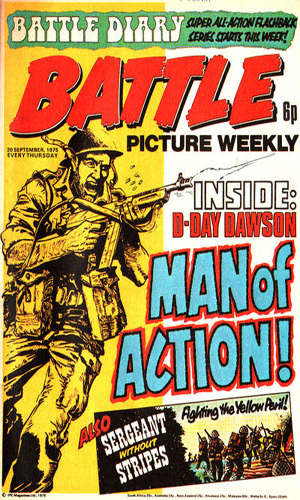 From Battle Picture Weekly No. 24 with 4 black & white pages. Front-Line Thrills With Daring Nick Carter! The year is 1943 and Nick Carter escapes from Stalag 23 in Northern Italy on a stolen Zundapp 750cc motor bike. He then comes across a British agent and helps him. This is how he becomes an agent himself for British Intelligence. From Battle Picture Weekly No. 25 with 3 black & white pages. Bullet is ordered to hold a vital bridge at all costs! Carter's first mission is to make sure a bridge over the Langro River in Italy stays intact for the British Troops that need to cross it. He has to take out some German, but the same motor bike now modified and the help of an Italian lad come in handy. From Battle Picture Weekly No. 26 with 3 black & white pages. Bullet races to take out a huge German gun! Carter's second mission is to destroy a very large railway gun that the German's are using on British targets in Italy. Can he finish his mission without getting killed by some Italians? Mostly like he can! 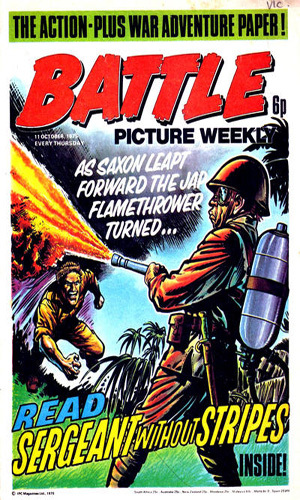 From Battle Picture Weekly No. 27 with 3 black & white pages. A daring chase through the streets of a war-torn town! Bullet is sent to the Italian town of Casoli to get some vital papers from Allied secret agents. After getting the safe that has the papers he is chased by Germans. Carter's third mission complete! From Battle Picture Weekly No. 28 with 3 black & white pages. Orders to 'Bullet' - find a crashed plane before the enemy! Carter is sent after secret radio equipment that was being tested on a British plane that has crashed in the mountains of Italy. Can Bullet complete a fourth mission? You bet he can and with style! 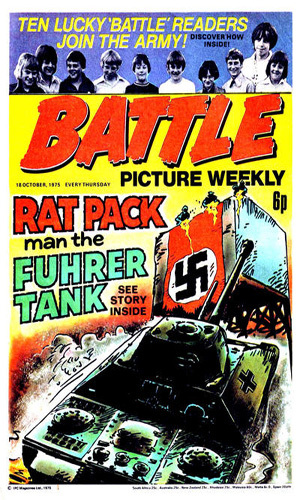 From Battle Picture Weekly No. 29 with 3 black & white pages. Action with the man that hits hard and fast! The Italians have surrendered and Bullet has the mission of telling those still fighting in Pleni Pass. Can he do so without getting killed by the Germans? Chances are on his side! 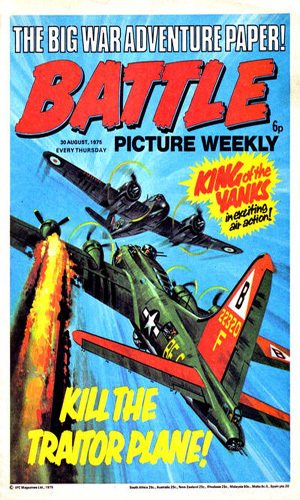 From Battle Picture Weekly No. 30 with 3 black & white pages. Suddenly, Without Warning Bullet Strikes Behind Enemy Lines! Carter is sent to photograph the new German armored car, but ends up losing his photo. No sweat, the escaped British POWs can drive the car back to the English line. From Battle Picture Weekly No. 31 with 3 black & white pages. Orders To Bullet - Destroy A New Nazi Killer Plane! A new German plane is killing British troops in Northern Italy and Bullet is given the mission to destroy it by ground. From Battle Picture Weekly No. 32 with 3 black & white pages. 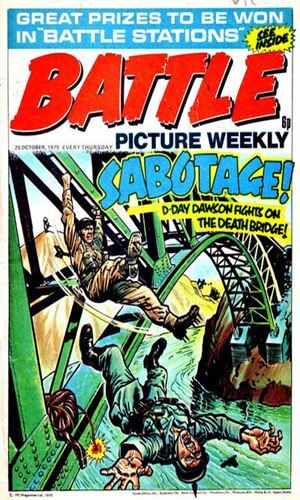 A Mission Of Sabotage For Bullet And His German Power Bike! British Bombers have tried to destroy a dam in Northern Italy, but failed. Bullet is sent to put flares on the dam so a British Mosquito Bomber can take it out. The reason for destroying it is to flood a fortified German line in the valley below. 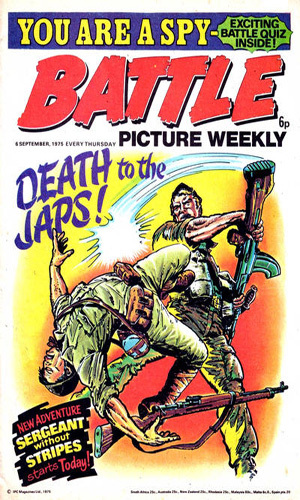 From Battle Picture Weekly No. 33 with 3 black & white pages. A Captured Bazooka Must Be Recovered - A Job For Bullet! A German on a stolen Harley Davidson steals a bazooka from the Americans. Can Bullet catch-up with the German, race him, win and return the bazooka to the Americans? There are no brakes to the truth here! 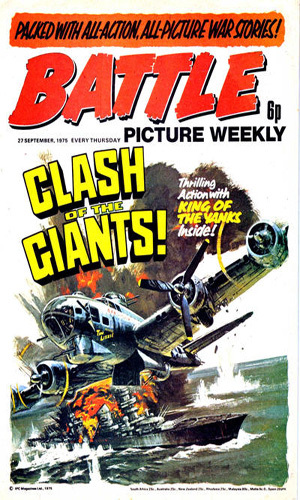 From Battle Picture Weekly No. 34 with 3 black & white pages. Can The Hard-Hitting Bullet Destroy A German Worship - Alone? Carter is sent alone to take out a German Warship with a magnetic mine, but discovers that he has to blast it some way to destroy the ship. Will he succeed and get away? 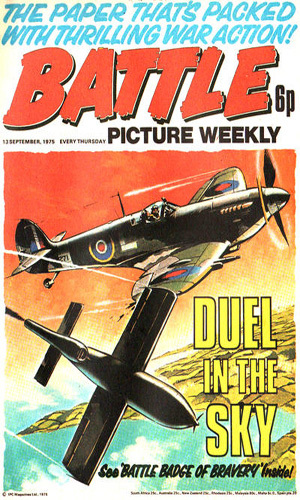 From Battle Picture Weekly No. 35 with 3 black & white pages. 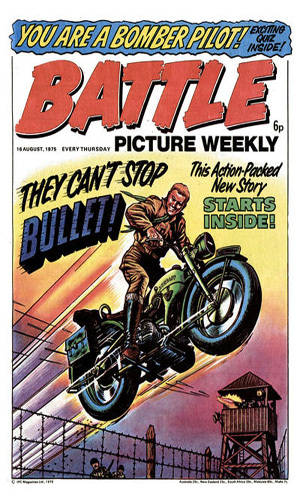 Powerful War Action From Bullet And His Zundapp 750! 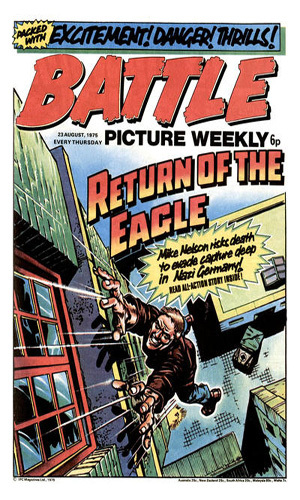 Carter is sent to destroy an Allies Spy Boat, but the Spy Paper has already been found by the Gestapo. So, Bullet must also destroy the boat they are in and he ends up using his bike to do it. With his Zundapp 750 sacrificed he has to steal another bike to get back to H.Q. That means it's curtains for Bullet and his spy work on the Zundapp 750. This interesting mixture of war-time behind the lines soldiering and intelligence collection takes place during the Second World War but it was created in the mid-70s. 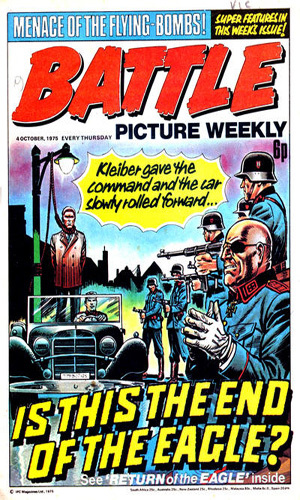 It is interesting that they would choose a name for the character that is the same as the long-running Killmaster character but since they usually referred to him either just his last name alone or by his nickname of 'Bullet', I guess the creator(s) didn't see a problem. When you first look at this series, you will likely, as I did, see that Carter has an amazing resemblance to Steve McQueen, the actor who played such an iconic role in The Great Escape in 1963. I am sure the style was intentional as 'Hilts' the cooler king loved riding bikes and did so in that movie to great effect during WWII and Carter does the same. So I guess the adjective 'amazing' is not so appropriate. These tales are fast and furious and diverse and interesting. They were meant for a quick shot of action and they give it. Sort of like a sugar rush - high for a moment and then gone. But tasty!